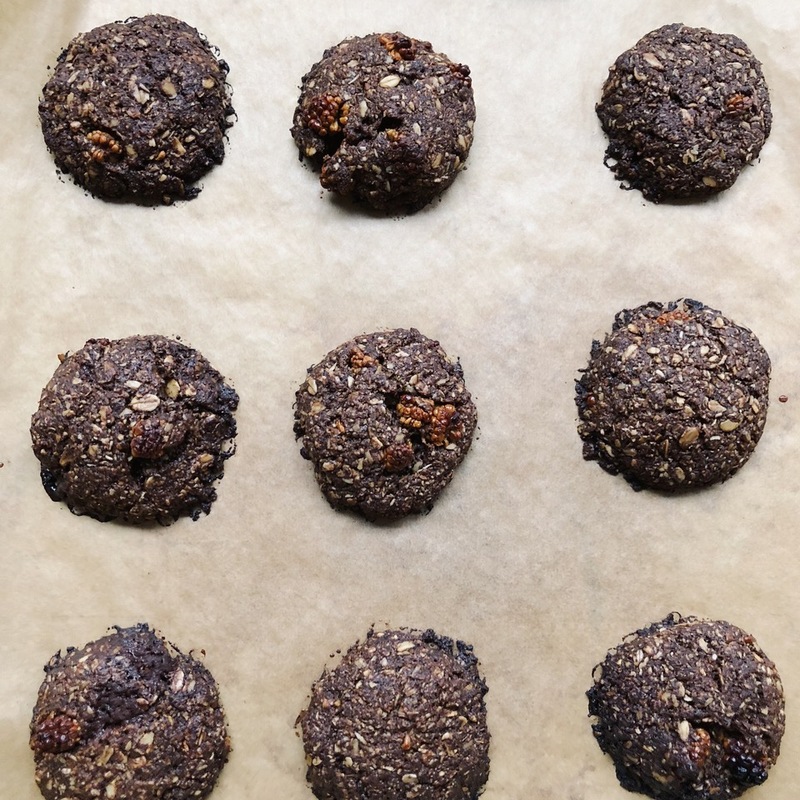 This yummy recipe for vegan mulberry, oat & chocolate cookies is a homemade creation by our dear friend Frauke Ryan. Frauke lives a sustainable lifestyle in a self-built wooden house in the North of Germany. She grows her own veggies and herbs in the garden and loves to experiment in the kitchen. Her cookie recipe takes between 8-10 minutes of prep time and the cookies will turn out deliciously for the whole family. Scroll down for the ingredient list and the instructions. Line a baking tray with baking paper and put the oven on 160-180 degrees Celsius (depending on your oven). 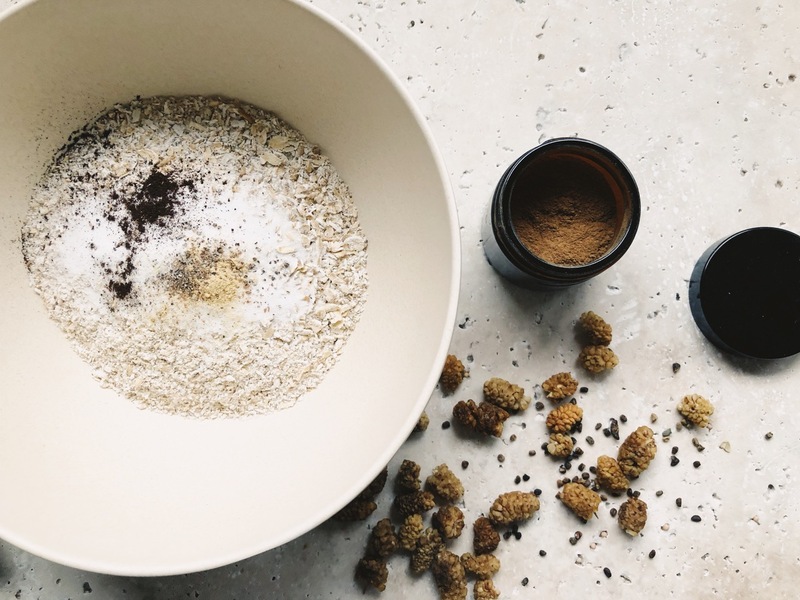 Pour the oats into a high-speed blender and pulse until you have a coarse oatmeal. Add all other dry ingredients and stir. Just carefully fold in the mulberries and chopped up chocolate. In a small cup, add 1 heaped tablespoon egg substitute (I use VegEgg) and 2 tablespoons of water and mix until a paste has formed. Let it sit for 5 minutes, add more water if the paste is too thick. Meanwhile, melt the coconut oil in a pan, add the sugar and stir until melted. Take off the heat and mix in the egg substitute. Fold the wet ingredients in with the dry ingredients until a sticky paste has formed. 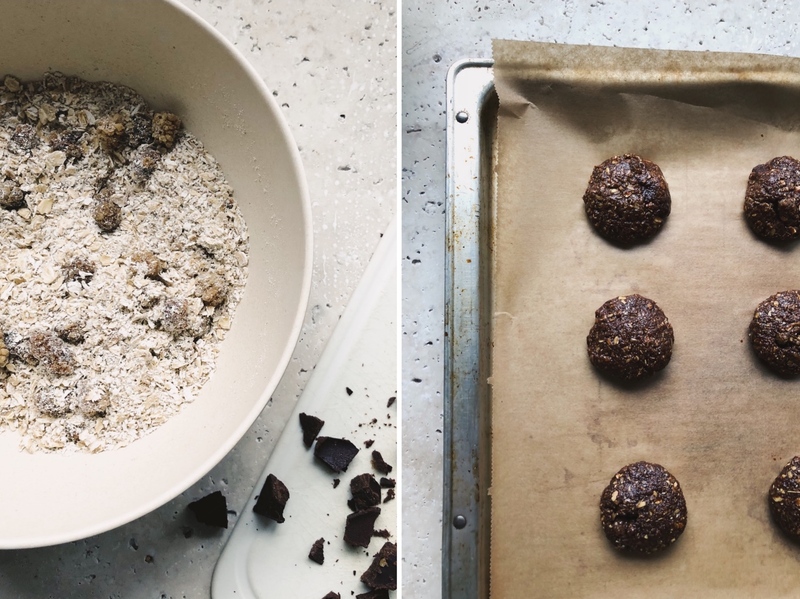 Take one tablespoon worth of dough at a time and mold a cookie. Place on tray and put in the oven once they are all done. Leave in the oven for 10-12 minutes until they are firm but still a bit doughy in the middle, so they will have a crispy texture on the outside and slightly chewy texture on the inside. Enjoy straight out of the oven or once they have cooled off. I made some vegan chocolate in advance, but a store-bought one will work just as well, even better, as it won’t melt as quickly as the homemade version. For the homemade version, melt ¼ cup coconut oil, stir in 1 heaped tablespoon of raw cocoa and a tablespoon of coconut palm sugar. Stir until sugar has melted, take off the stove and let cool before you fill it into an ice cube tray and freeze until needed.